Consumers love cotton because it offers softness and comfort, but it also offers the benefit of versatile antimicrobial options to keep the consumer feeling fresh. 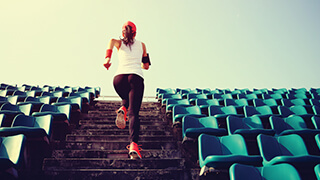 The below technologies can all be blended with or applied to cotton fabrics. PurThread is an antimicrobial solution that embeds recycled silver salts into polyester fibers in order to kill odor-causing bacteria. PurThread can easily be blended with cotton to create cotton-rich blends with permanent anti-odor benefits. The silver salt is in the core of the PurThread fiber, which gives the antimicrobial protection a longer life and does not weaken, wear off, or wash away after multiple launderings. PurThread is treated like a regular polyester yarn during the finishing process. All of the silver used during the PurThread process is EPA-registered and does not contain nanoparticles or nanosilver. 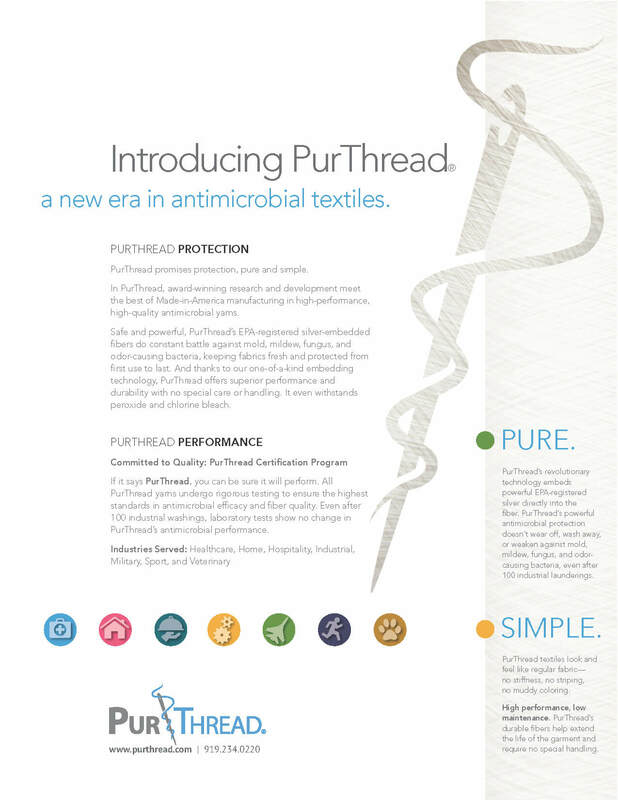 Learn more at www.purthread.com. XT2® is a technology from Noble Biomaterials that incorporates silver into polyester yarns during the extrusion process for a long-lasting odor solution. The silver technology inhibits the growth of bacteria and fungi on fabrics and keeps apparel odor-free. XT2® is available in staple or filament yarn, is dyeable, and can be blended with cotton to create cotton-rich performance fabrics. XT2® is registered with the EPA and does not use nanotechnology or nanosilver. Learn more at www.noblebiomaterials.com. 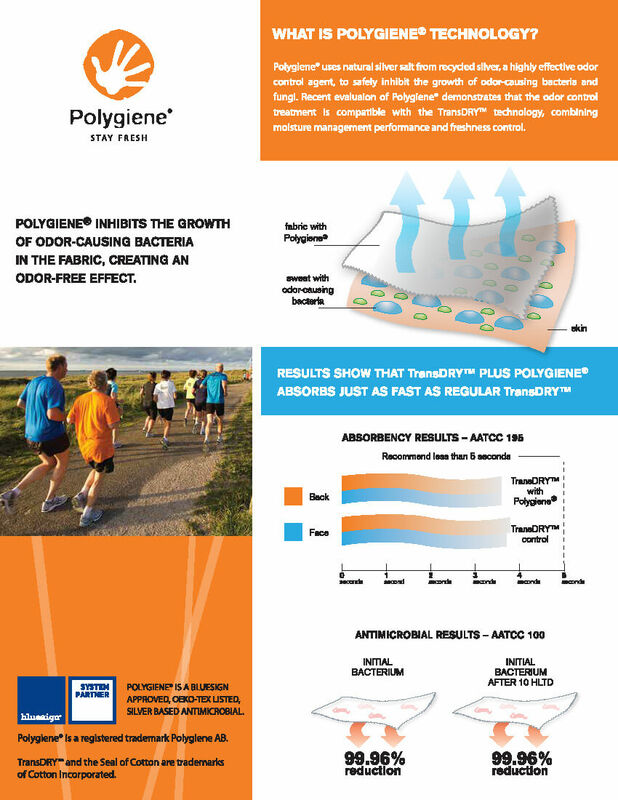 Polygiene® uses natural silver salt from recycled silver to inhibit the growth of odor-causing bacteria and fungi. Polygiene® is a fabric finish and is shown to be compatible with Cotton Incorporated’s TransDRY® moisture management technology. 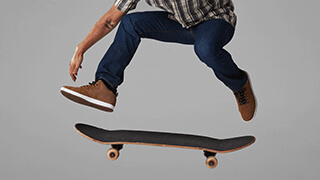 Testing shows that TransDRY® technology plus Polygiene® absorbs just as fast as regular TransDRY® products, with the added antimicrobial and odor control benefits. Polygiene® does not contain nanosilver. Learn more at www.polygiene.com. 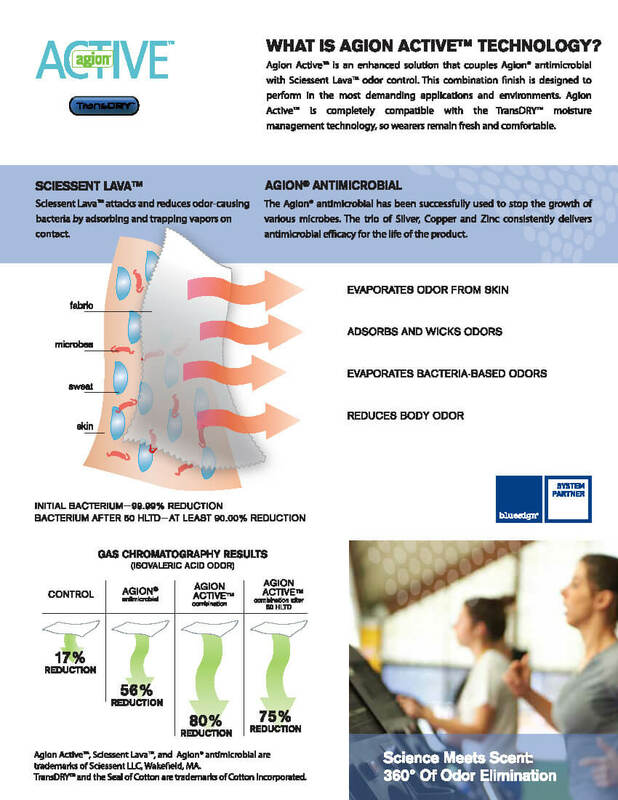 Agion Active™ is an enhanced performance solution that combines Agion® antimicrobial technology with Sciessent Lava™ odor control. This combination attacks and reduces odor-causing bacteria by trapping vapors on contact, while stopping the growth of various microbes with a trio of silver, copper and zinc. Agion Active™ is applied as a fabric finish for long-lasting freshness, and has been tested to be compatible with Cotton Incorporated’s TransDRY® moisture management technology. Learn more at www.sciessent.com. Hear from Dr. Rachel McQueen of the University of Alberta as she discusses the connection between clothing and odors as well as her research into the science behind the connection.